Are we coaches or do we offer coaching? As I was heading back home, I wondered – is coaching something we do or the way we are? 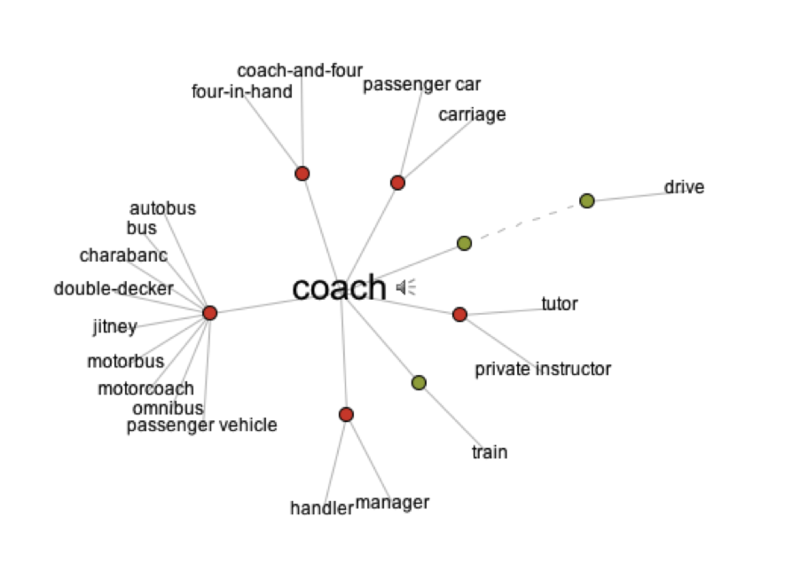 So once I got home, I looked up the definition for both words (coach & coaching) and came across Visual Thesaurus (image below). The reason I was wondering is that when I meet people who “do coaching”, they always say “I’m a coach”. I’m not actually disputing that they are (or aren’t) coaches, it’s just that I wonder if they have assimilated the coaching role so much as to BECOME coaches. Maybe it’s simply like someone who defines himself as being an accountant, an engineer or a clown when in reality it is because their day-job is accounting, engineering or clowning. This leads me to wonder, if accountants stop doing accounting after 5 pm, does it mean coaches stop coaching after work hours? It seems to me, based on the many coaches I personally know that very few actually stop coaching – that’s almost a way of being – coaching the kids, sometime the spouse, some of the friends and so on. Should we call ourselves coaches only when we are on duty or is there a better name to describe bipeds who provide coaching to people around them? Personally, I have decided a while back that I do not define myself as a coach. Coaching is simply a tool for me – a very effective one, I would add – that I use to help people accomplish their objectives. As Agile Coaches, we aim to be efficient. We analyze the situation around us, we ask questions, we experiment, we share our thoughts and observations, we make suggestions and recommendations. We try to be helpful. Are we always efficient in the way we ask our questions? Could we ask our questions differently for better impact? Below is a list of qualities associated with Powerful Questions taken from the reading material of the certification program I’m currently undertaking. And include the question “what else?”. With hindsight, what can you see? If you were an expert in this field, what would you do? Formulating a question isn’t always easy but to be an impactful coach, properly asking the question is critical. Hopefully, these few tips can help you become a better coach.